Is Scarlet Snow Belo pining for a sibling? Scarlet Snow Belo tells dad Hayden Kho Jr. that she wants a baby sister. 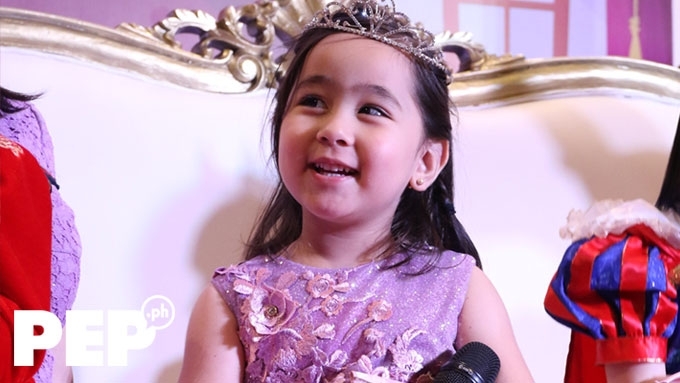 The celebrity tot turned four on March 3 and celebrated her special day with a unicorn-themed party. 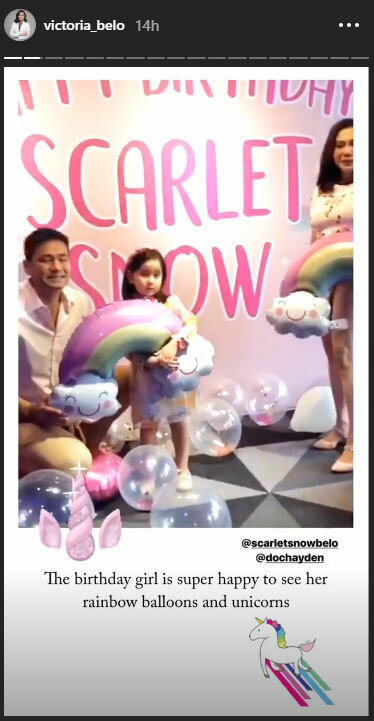 It appears Scarlet Snow Belo is praying for a sibling. 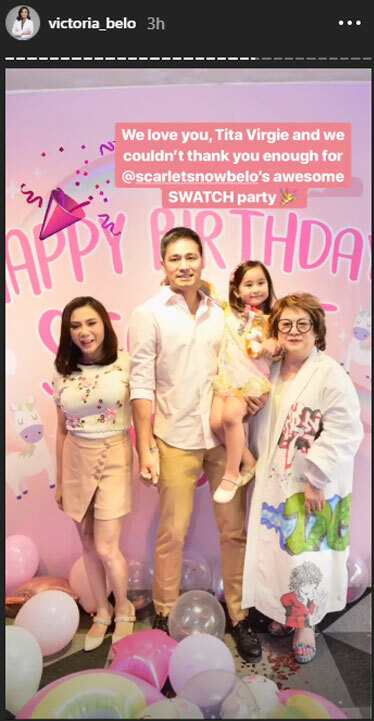 The day before Scarlet Snow turned four on March 3, she had a pre-birthday celebration with her family at Jollibee Ortigas Roosevelt. It was attended by the press as it was also an endorsement event for the celebrity tot. 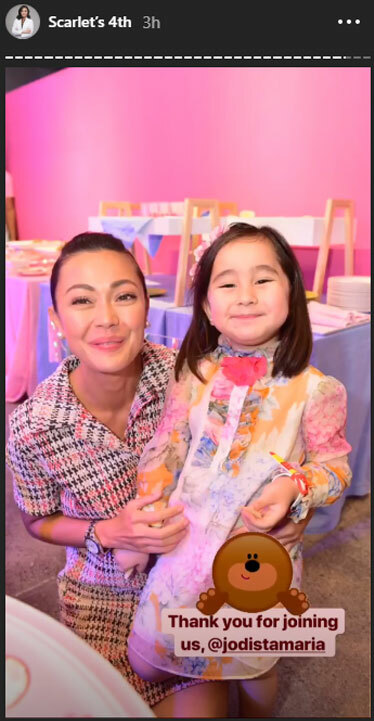 During an interview, Hayden Kho Jr. and Vicki Belo revealed their daughter's prayer: To have a baby brother and sister. "Bigla na lang siya nag-ganun." But are Hayden and Vicki planning to have a new baby? Vicki quipped to the cameras, "Secret! Abangan ang susunod na kabanata!" Hayden, on a serious note, added, "Huwag ganyan, huwag ganyan. "If God's will, iyan yung sagot sa ganyan." 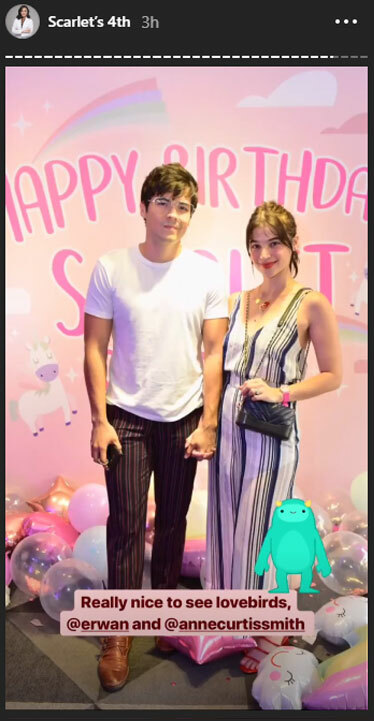 Back in September 2018, Vicki mentioned to PEP.ph (Philippine Entertainment Portal) the possibility of having another child. "Of course, if one more comes, if he decides, then I’m sure I'll still enjoy it." 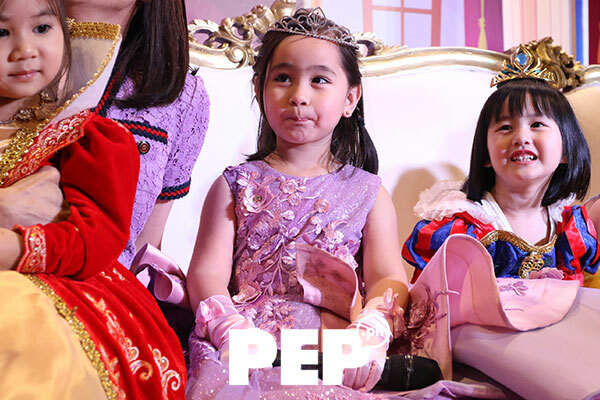 In a quick interview with PEP.ph after Scarlet Snow's endorsement event on March 2, Vicki and Hayden shared their birthday wish for their little girl. 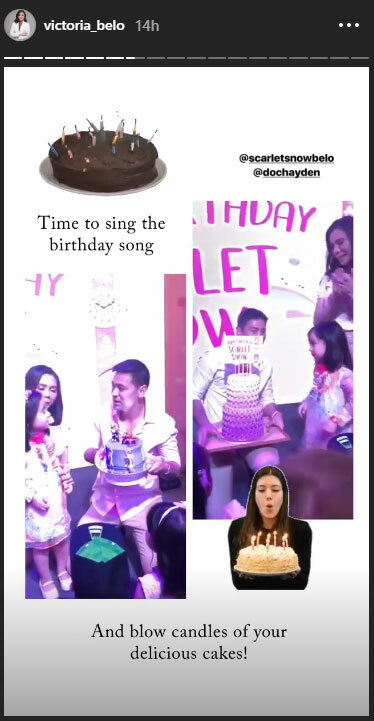 Vicki said, "My birthday wish is for her life, not just for her fourth year. "We just keep praying that she be closer to Jesus, that she will have a softer heart, a kinder heart kasi when you’re young, you’re still a little not so aware, di ba? "But I really want her to be a good Christian above all…"
Hayden added, "For her to be surrounded by people who will guide her to the right path. Teach her the right values, people who will actually, genuinely care for her." 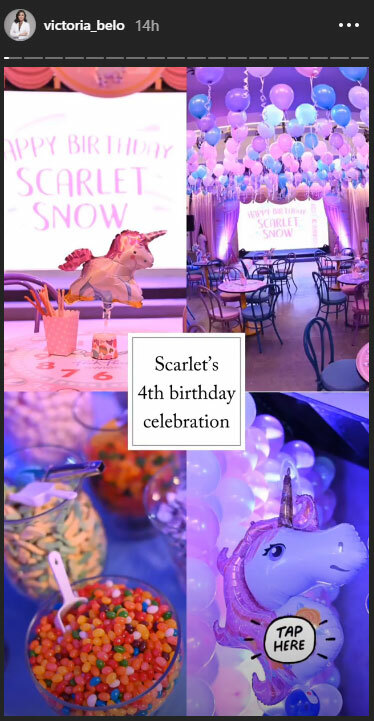 Scarlet Snow had a unicorn-themed party for her fourth birthday on March 3, her actual birthday. Virgie Ramos (rightmost) of watch brand Swatch organized the birthday party. 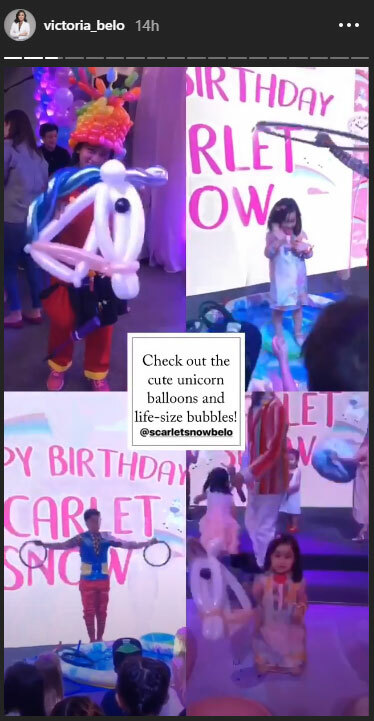 The birthday bash was full of rainbow balloons, unicorns, and "life-size" bubbles. Scarlet Snow and Mommy Vicki had fun dancing. 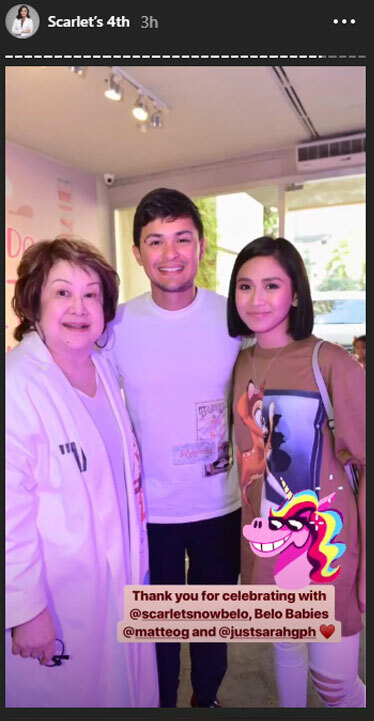 Joining the kiddie fun were Anne Curtis, Erwan Heussaff, Matteo Guidicelli, Sarah Geronimo, and Jodi Sta. Maria. 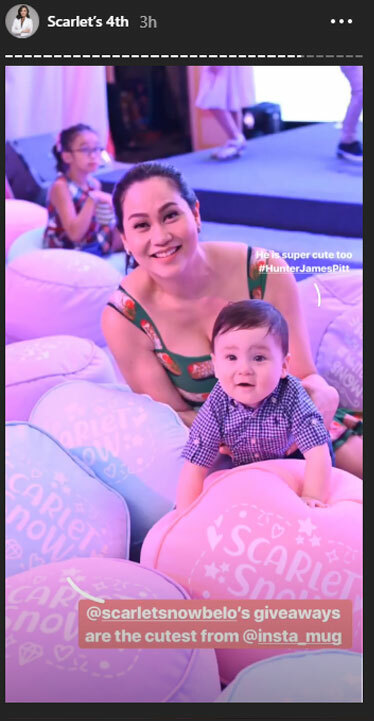 Cristalle Belo was also there for her baby sister's birthday, too, and brought along her son, Hunter James.